During the week of August 13-19, three Children’s Miracle Network Hospitals media partners collectively raised over $1.95 million for their local hospitals through live radiothon events. Congratulations to Bonneville’s KTAR and Arizona Sports (KMVP) for breaking another fundraising record – their 19-hour Give-A-Thon simulcast raised $1,728,142 to benefit Phoenix Children’s Hospital! This total surpassed their previous years’ total of $1.67 million and, once again, makes them the highest fundraising media event in the nation through Children’s Miracle Network Hospitals. Thank you, Arizona, for being #ChampionsOfHope and helping to set another record at this year's Give-A-Thon for Phoenix Children's Hospital Foundation. The Give-A-Thon aired from 2:00-7:00pm on Wednesday, August 15 and from 5:00am-7:00pm on Thursday, August 16. The event was a collaborative effort between KTAR News 92.3 FM and 98.7 FM Arizona’s Sports Station and, since 2009, has raised over $12.8 million for Phoenix Children’s Hospital. The two stations set aside programming time to feature stories from patient families who have been treated at the hospital. Listeners could call in to donate or make their donation online. Anyone who made a monthly pledge of $20 or more, or a single gift of $240 or more, became a “Champion of Hope.” In addition to their donation helping to provide life-saving medical care at the hospital, a teddy bear was also given to a patient in the donors’ names. The stations also shared Behind the Scenes video tours and interviews to show how donations are making an impact at Phoenix Children’s Hospital, including the Child Life Zone, the Emily Center Family Health Library, and the Emergency Department. Mix 93.1 in Tyler, Texas hosted the 20th annual “Mix with Kids Children’s Miracle Network Radiothon” and raised $51,439 for the CMN Hospitals programs and pediatric services at Christus Mother Frances Hospitals and Clinics throughout East Texas. Hosts Lucky Larry and Mandee Montana invited Miracle kids from the hospital along with their families, doctors, nurses, and hospital support staff on air to share their stories as East Texans called in their donations and pledges in near record numbers to bring premiere care and equipment to East Texas. Funds raised will help support the neonatal intensive care unit (NICU), the special needs clinic, children’s center, mother unit, ambulance services, emergency room services, clinics and more. 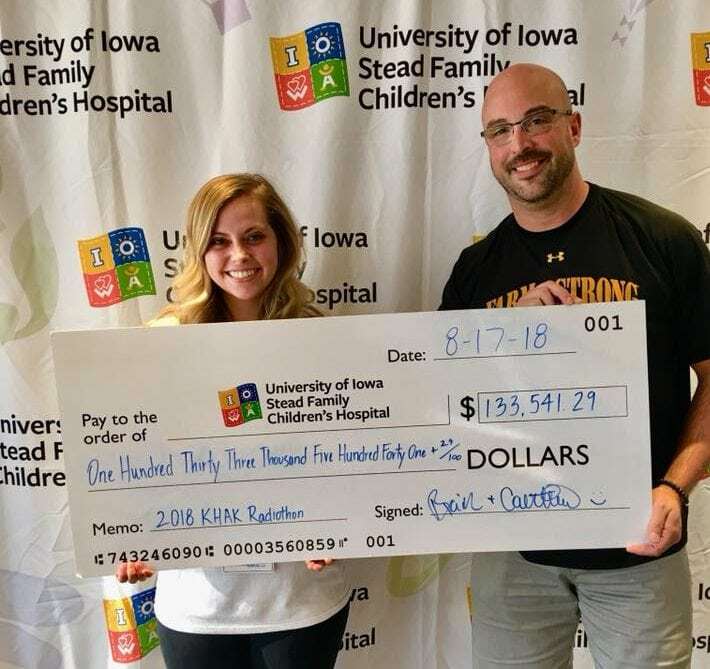 The 22nd annual KHAK radiothon to benefit the CMN Hospitals programs at the University of Iowa Stead Family Children’s Hospital ended with another outstanding total of $133,541! KHAK’S Brain and Courtlin broadcast live from the 12th floor of the hospital, from the same area where all of the kids being treated wave to Hawkeye fans during football Saturdays. One of the many highlights of their event was the celebration of an 18 year old KHAK fan’s end of chemo treatment party during the radiothon. Brain and Courtlin celebrated on-air with listener Danielle ringing the bell to signify the end of her chemotherapy treatments. They then challenged listeners to call in and donate $75, which would cover the cost of an end-of-chemo party for a patient at the hospital. Watch Danielle’s party in the video from KHAK below. We were lucky enough to be able to be a part of Brooke’s last chemo treatment party. Such a special moment. ❤️ You can donate to the KHAK CMN Radiothon for the University of Iowa Stead Family Children's Hospital by calling 1-800-456-2772. This uplifting moment and many others drove listeners to donate nearly $14,000 more than 2017. Funds raised stay right in Iowa City at the hospital to fund research, programs and equipment at UI Stead Family Children’s that are not covered by insurance. Throughout their event, 98.1 KHAK shared live videos on their Facebook page, reaching nearly 40,000 views, sharing updates from the event and video interviews with patient families as they were also being shared live on air. Wyatt’s mom Monica shares how the children’s hospital helped her family feel as “normal as you can in a hospital”. Children’s Miracle Network Hospitals® raises funds and awareness for 170 member hospitals that provide 32 million treatments each year to kids across the U.S. and Canada. Donations stay local to fund critical treatments and healthcare services, pediatric medical equipment and charitable care. Since 1983, Children’s Miracle Network Hospitals has raised more than $5 billion, most of it $1 at a time through the charity’s Miracle Balloon icon. Its various fundraising partners and programs support the nonprofit’s mission to save and improve the lives of as many children as possible. Find out why children’s hospitals need community support, and learn about your member hospital, at CMNHospitals.org and facebook.com/CMNHospitals.